When last we journeyed through realms of perilous wonder, I unveiled my mad scheme to go back to college and get a degree. This summer I turned mad scheme into bold action, taking not just one, but x+5=7 algebra classes. Each class condensed a semester’s worth of knowledge into a five-week period. While I was able to keep up with some fiction writing beneath that workload, unfortunately the blog languished this summer. It’s the 21st century. Why can we not implant knowledge directly into our brains, Matrix-style? And show him I did. I scored well in both classes–a great feeling after being out of school for so long–and put myself in good shape for College Algebra, which starts today. I even made the surprising discovery that I like math. Math and I are traditional enemies. During both high school and my previous attempt at college, taking an algebra course was akin to locking myself in deadly combat with a clawed and tentacled flesh-eating math-beast, with a rage written in the very lightning that flickered across dark and boiling clouds. 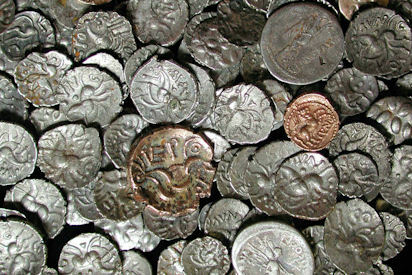 Algebra Word Problem: Dirk Steele, renowned two-fisted pulp-action adventurer and philosopher, has uncovered a forbidden treasure hoard consisting of nickels and dimes and valued at $8.25. If he has 7 more nickels than twice the number of dimes, how many of each type of coin will inflict an ancient curse upon him? Now that I’m back in school, I’m considering a degree that requires lots of math. I figured it would work out better if I could self-hypnotize myself into liking it more. Self-Hypnotizing Me: Math is just like sitting down and doing puzzles or something…you know, like Sudoku. I like Sudoku. Therefore, I like math. Enemy of All That is Math Me: Uhh…yeah…whatever feeds your zombie, dude. It turns out that Self-Hypnotizing Me was right. Doing algebra homework was a lot like solving puzzles, and I enjoyed it enough that I decided to pioneer a new realm of dark mathematics. A suave and sophisticated vampire who brushes his fangs regularly and has great check-ups can drain the blood from a victim in 10 minutes. A wild and unkempt vampire with bad breath and a broken fang can drain the same victim in 15 minutes. How many minutes would it take them to drain the same victim if they worked together? Sometimes it’s amazing what a change in perspective can do for us. Has a change in your perspective made it possible for you to achieve a goal that seemed insurmountable before? And just how many minutes would it take the two vampires to drain the same victim if they worked together, anyway? This entry was posted in The Human Experience and tagged author, college, fiction, mike schulenberg, writer on August 28, 2012 by Mike Schulenberg. I was wondering what happened to you! I’m glad that there has been a very interesting turn of events for you in terms of math! I’ve always thought of it like a puzzle. You get to be one of those fascinating mythical creatures – creative soul who loves math. That’s SO cool. And as for the vampires? Hmm…my guess is they don’t like to share and would kill each other before they even got to the victim! Yeah, it’s not like I haven’t wanted to stay on top of my blog, because it’s a lot of fun and I’m meeting some great people. I guess I just couldn’t quite figure out how to juggle it addition to summer classes, fiction writing, and life. Now that I’m taking classes at a normal pace, I’m hoping to be able to post at least once a week, but we’ll have to see how that goes. By the way, do you happen to have a blog I might be able to visit? When I click on your name, it takes me to a protected blog. Ohh how weird! I thought I fixed that…hmmm…I’ll have to check that out! But I do! Here’s my blog! Cool, thanks…I’m following it and stuff. It looks pretty great. Hilarious, Mike! And congrats on that achievement. I tackled algebra in my 30s and went on to precalculus, calculus and a year of statistics. I hate word problems though. They’ll always be damned as far as I’m concerned. How did you like precalculus (that’s also called trigonometry, right?) and calculus? I’m pretty certain I’m going to end up tackling those myself regardless of my final choice for a degree, since all the ones I’m looking at are pretty math-heavy. I used to hate word problems as well, but now I actually kinda like them. They feel a bit like solving riddles, which fits nicely into the whole puzzle theme. Glad you are liking algebra. If you ever get stuck on a concept in algebra (or many other subjects) check out this website: http://www.khanacademy.org/ . This guy does videos on higher math and science topics, etc. Sounds like you don’t need him so far! I really need to check out khanacademy.org–I’ve heard a lot of good recommendations for it. So far I have been doing well without it, but since I’m currently sitting at the highest state of algebra I’ve ever achieved, with more in front of me, I might need it in the future. But I think I like how The Matrix one turned out better. Good to have you back and I love your take on algebra!! Hey, cool…it does come out to 6 minutes. It’s lucky that the answer happened to end up as a nice round number. I just picked a couple of numbers at random. I’ve been fortunate enough to have never witnessed a vampire draining, so I have no idea how long it really takes. Ah Jeez, how different my failed algebra life might’ve been had I shelved my flaming dislike of math long enough to consider the very wise “Puzzle Trick”. And yes, I suppose the tidy vampire does get an A+ for style…very important in the modern age, no doubt. I don’t know that I would have an easier time with paranormal algebra, but at least it would be entertaining. I was more of a geometry girl, so if you needed to, say, determine the best dimensions for your zombie apocalypse safe house, I’m there. Height is important in that situation, of course. The only geometry class I’ve ever had was back in high school, and I remember disliking it even more than the algebra class I had the year before–probably because by then I had decided that I wasn’t good at math and didn’t like it. I’m kinda interested in taking another one now to see if I enjoy it, but I don’t know if I actually need it for my degree, so it might not happen. I do believe geometry would be super helpful in designing a zombie apocalypse safe house. I could also see physics working alongside it to construct elaborate Home Alone-esque traps to foil any zombies who might get inside. Way to go on rockin’ the algebra classes! Very impressive for this non-math inclined person. I think you summed it up for me nicely: “locking myself in deadly combat with a clawed and tentacled flesh-eating math-beast”. Yep, that is me trying to bend my brain around some math concepts. I’m with you – can’t Dirk just sort and count the coins? Why make it more complicated? My theory is that Dirk Steele prefers to use the power of algebra to solve his coin problems because he believes it impresses people at parties. When one is a renowned two-fisted pulp-action adventurer and philosopher, it is undoubtedly important to do so. Yes, College Algebra is where most of us have learned how to account for the snacking habits of vampires and how that impacts their rate of blood drainage on their victims. Unfortunately, I missed that day so I can’t offer further advice. I think that’s where Dirk comes in – he can extend himself a bit beyond coin counting seeing as he is the big time adventurer and philosopher. Fine. 6 minutes. Fine. But what if the dirty vampire was being chased by a werewolf or the uptight vamp had to spend some time prepping the victim and where does the zombie factor come in? They did teach you about the zombie factor, right? I mean, you mentioned it, so I thought they must have. Congrats on surviving a summer that would have wilted a lesser dude. So entertaining to hear about your Algebra adventures, now that you can spare a moment for your blog. I love math in theory–it’s the figuring it out part that gets me-especially word problems. Sudoku rocks. Yeah, figuring out how to set up a word problem was always really tricky for me. I seem to have gotten a bit better at it this summer, though, so I’m pretty happy about that. And Sudoku does rock. I haven’t been into it for very long, but I love having it on my phone so I can dig it out of my pocket and work on a puzzle during idle moments. Only you MIke, only you! Fantastic post dude! “Behold the algebra of the damned” LOL! I am hitting my head on the keyboard! Don’t make me do it Mike! Please! I’m getting a panic attack just thinking about word problems. I don’t care what you say, beware, Math is still the enemy! May the force be with you! I’m so glad you’re liking school, and found the fun in math. I totally agree that perspective makes all the world of difference! It’s nice to read a new post, and look forward to the next one, whenever that might be! Now that summer is over and I’m taking classes that move at a slower pace, I’m hoping to post at least once a week or so. I also might experiment with my content a bit and see if I can come up with some good topics that would be relatively easy to put together. What a wonderful way for me to ‘think’ math might be possible. I’ve always said I never met a number I liked and all that x and y stuff drove me up the wall. I’m delighted you checked in with a blog. I’ve missed seeing you here. Thanks very much, Sheri. I hope to be around more frequently now that I’m in classes that move at a normal pace. Epic post Mike! Totally quadratic. 🙂 Love the Neo clip and the vampire word problem is hilarious. I knew you’d rock algebra. You can do whatever you set yor mind to. Seriously. It’s always good to see you back here! I enjoyed the post, the Matrix clip, and scratched my head for far too long over the math problem before conceding defeat to the mighty math monster. Or math beast, if you prefer. I had no idea I’ve gotten so rusty! Although if I had my druthers, (and I always get my druthers, don’t you know?) the time it takes to drain our hapless victim would be exactly 6.66 miserable minutes. Some numbers are just creepier than others. Thanks, Kirsten. I’m hoping to post a little more often now that my knowledge implantation is occurring at the slower speed of a regular semester. Good to see a post from you, Mike. Hope your classes will give you time to post a bit more often – I miss them. I hated algebra in high school – probably because I had a teacher who couldn’t explain it and a brain (mine) that just isn’t well wired for math. How I escaped having to take “bonehead” math in college I’ll never know. Oh, yeah…I didn’t like algebra in high school at all. But now that I’m older and can see how being good at math can help me do some of the things I might like to do in the future, I thought I’d approach it this time around with a more open mind than I have in the past. It would take them five minutes. Am I right? That’s a cool algebra problem. Thanks…I certainly think I would’ve been more likely to give algebra a fair shake in high school if algebra problems would’ve been more like that, instead of those train ones. And actually, I believe it would take the vampires 6 minutes, if my calculations were correct.